The advance agent is the preferred method for deploying the agent in most environments. This agent has been created to leverage Ivanti bandwidth-friendly technology during the agent deployment. It can reduce the amount of network bandwidth used for Windows-based agent configuration. The Advance agent uses a two stage deployment method. The Advance agent is an MSI file that is deployed in advance of the full agent. The MSI installs and then initiates the download and install of the full agent package. The advance agent works well for most devices, including laptops with intermittent or slow network connections. However, it doesn't support PDAs and other handheld devices. The advance agent is a small 500 KB MSI package. When this package runs on a managed device, it downloads an associated full agent configuration package, which may be up to 15 MB in size, depending on the agents you select. In the Advance agent configuration dialog, you can configure what bandwidth-friendly distribution options the MSI will use for the full agent configuration download. The advance agent works independently from the core server once it starts downloading the full agent configuration. If a device disconnects from the network before the agent configuration finishes downloading, the advance agent will automatically resume the download once the device is back on the network. When you create an advance agent configuration, it takes a few seconds for the console to create the full agent configuration package. The console places the advance agent package (<configuration name>.msi) and the newly-created full agent configuration package (<configuration name>.exe) in the core server's LDLogon\AdvanceAgent folder. The file names are based on the agent configuration name. Schedule the small MSI portion for push distribution. Run the MSI manually on each device. Manually configure the MSI to run via a login script. Once you deploy the advance agent to devices, the advance agent starts downloading the associated agent configuration. The agent runs silently on the managed device, without showing any dialogs or status updates. 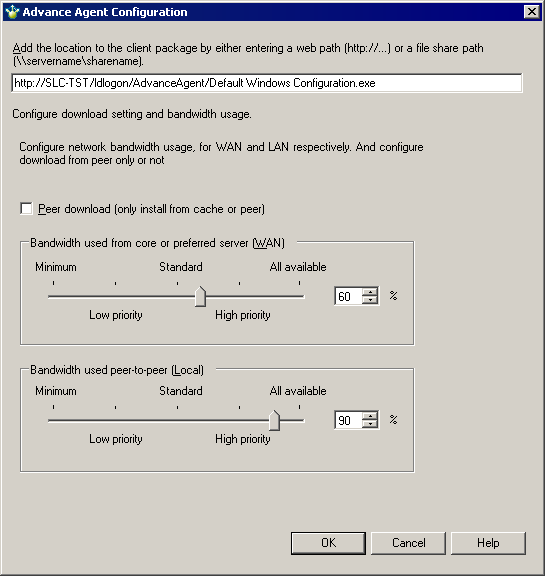 The advance agent uses the bandwidth preferences you specified in the Advance agent configuration dialog, such as Peer Download and dynamic bandwidth throttling. Once the MSI installs and successfully configures agents on a device, it removes the full agent configuration package. The MSI portion stays on the device, and if the same MSI runs again it won't reinstall the agents.